← Nikolai Vitti tried to kill the IT program at Jacksonville’s largest high school. Now he wants credit. Is Superintendent Vitti’s cronyism harming Duval County students? I am respectfully and publicly calling for the Duval County School Board to investigate why Duval County has lost the services of Crystal Force. I believe Ms. Force’s departure is the result of cronyism. I believe Dr. Vitti’s cronyism directly harms our students. I believe this cronyism is how Dr. Vitti does business and that the School Board should determine if my opinion is correct: that Vitti’s pattern of behavior leads to sufficient cause to part ways with him. One of our main concerns as teachers has been the appearance that Vitti ousted or demoted experienced District personnel without regard to their competence, usually in favor of his own friends, who often have demonstrably less experience and expertise. Foremost in my mind as a Career/Technical Education (“CTE”) teacher was Vitti’s treatment of longtime CTE Director Chris Force. Dr. Vitti (from Miami-Dade) installed Arlinda Smith (from Miami-Dade) to become Executive Director of CTE; Force was demoted to the classroom in short order despite her high qualifications and glowing opinions of her colleagues (see below). Arlinda Smith had no experience directing a CTE department of any size (according to her LinkedIn profile), and is not qualified to teach a CTE course in the state of Florida. Speaking for myself, Ms. Force always supported our endeavors when possible, gave reasonable concerns when she couldn’t, and continually sought to gain knowledge. She realizes that Vocational Education is incredibly broad (the department covers Information Technology, Cosmetology, Automobile Repair, Masonry, and many other disciplines). She realizes that means most instructional details should be yielded to the teachers certified to be experts in these areas. In short, Chris was the rare District official who realized her role was not to control teachers, but to guide and facilitate our efforts to educate students. My high opinion of her was confirmed when I observed — despite the humiliating treatment she received from DCPS — that Chris continued to work as a leader in the Duval County Public Schools CTE community, mentoring and supporting her colleagues just as she always has. Not because it was in her job description, but because it was in her nature. This is in stark contrast to my experience with Dr. Vitti’s appointed replacement, Arlinda Smith. Vitti and Smith had their own misguided ideas for Information Technology Education, and tried to replace our rigorous, relevant program at Sandalwood with what I and many others considered to be fluff. I showed the plans of Dr. Vitti and Ms. Smith to IT directors and prominent members of the Jacksonville business community. When I showed them the curriculum — four years of rudimentary, nearly unemployable Web Design — and that they wanted to replace our program with theirs — reactions ranged from strange looks to expressions of disgust. It leads to an expensive yet, in my opinion, completely useless certification called “CIW”. In an informal survey of about a dozen IT managers, including from Fortune 500 companies, exactly zero of them had ever heard of the “CIW” certifications being pushed by Vitti and Smith. My colleagues and I had to fight, and fight hard, alongside two different principals, to preserve our program which offered well-known, rigorous and relevant certifications from Microsoft, Adobe and CompTIA (CompTIA = “A+”, “Network+” and “Security+”). I refused to allow our kids — some of whom turned down Stanton (the #12 high school in the nation) or Paxon (#86 in the nation) to attend Sandalwood because of their interest in an IT career — to waste their time sitting in four years of Web Design classes. We won that battle, but Arlinda Smith retaliated by inexplicably refusing to pay $7,000 — much less than she likely was spending at any other high school — for a pack of 1,000 tests plus practice exams and curriculum for the industry certification tests we administered. Ms. Smith stated she would only would pay for the CIW exams, which we didn’t want to teach because it was not what our students, parents and business partners wanted. Nevertheless, Ms. Smith put stumbling blocks in front of us whenever possible for most of the year. My colleague and I (both of us mere teachers) were publicly rebuked (directors, executive directors, my assistant principal and principal, etc. were all copied) for securing the donation of a 64-station virtual computer lab from Florida State College, requesting CTE’s help, receiving no response, and opening a simple help desk ticket with IT to open a port in the firewall (which any teacher is allowed to do). No congratulations or genuine offers of help to any of us for securing a donation, just roadblocks and rebuke. But one of the kickers for me was this: late in the year, right when we were beginning to give exams to our students, we were told we had to set appointments for district personnel to administer them. I felt this was against the real-world way of earning industry certifications — people take industry certification exams when they are ready. [Mike] has asked if I could come proctor tomorrow. Timing would be after I’m finished at Paxon. No. His principal sent me testing dates. He needs to abide by the rules. I am curious: what rule am I breaking by asking you to send a proctor “any day someone can be spared” (my exact words to you)? [REDACTED] responded to the request, sought to help my students and asked to clear it with you. You blocked [these] efforts. Your rationale was not that [this person] was too busy, or anything that could be construed as you thinking about students, but rather you were thinking how you could personally teach me a lesson “to abide by the rules” (again, see your own words below). In short: I am asking you, Ms. Smith, to do your job as instructional support personnel to remove stumbling blocks rather than placing them in our path as has happened much too often in the past year. We dealt with lack of support like this the entire year from Ms. Smith, some of which bordered on intentional sabotage. We were very fortunate that our principal took money out of her budget (diverting that money away from other things, like paper) to pay for the exams that CTE has always paid for. Our principal understood that what we were teaching was more useful than what Vitti and Smith brought with them, and that the school would receive that $7000 many times over in grant money from the certifications. To my knowledge, Sandalwood was the only school in Jacksonville that had to use its own school funds to pay for industry certification exams. I believe Ms. Smith had a personal vendetta against me for pushing back against the CIW program. We were fortunate school leadership (NOT district leadership) felt our program was a win-win; it allowed us to (a.) give kids an opportunity to learn real skills, while (b.) working towards the mindless stats we’re forced to care about. And I think we did a good job on both counts. Our CTE Academy, the Sandalwood Academy of Information Technology, received multiple accolades. Our students genuinely grew in knowledge and abilities before our eyes during the 2013-14 school year; I will treasure the personal accolades and achievements by my colleagues and students for the rest of my life. This success was in spite of the efforts of our leadership to disavow and even interfere with our efforts to keep the program rigorous and relevant for our students. Now that Vitti and Smith cannot ignore our success, they want in. Forgive me, but I don’t want my colleagues’ efforts to result in the wrong people cementing their positions in Duval County, or adding to their credibility so they can inflict more harm on a bigger scale. Even if you hate measuring things with Facebook likes as much as I do, 500 “likes” and 180 comments means something. People love and respect Chris Force. So much so, that the very next school year after Dr. Vitti demoted Force, presumably because she was “not good enough” to direct the CTE department of the #58 (of 68) school district in Florida, was just scooped up by the state’s #1 traditional school district to serve as their new CTE Director. I’m extremely happy for Ms. Force; she deserves better than what she got in Duval, and she is too intelligent, talented and inspiring to limit her impact to only 150-200 students per year. I feel deeply for the countless wonderful Duval County teachers and students who continue to work under leadership who continually makes such poor decisions. It simply does not seem they have the students’ and educators’ best interests at heart. Those individuals, especially our students, deserve better than what Nikolai Vitti is giving us. As for myself, leaving DCPS was the result of many factors. I feel fairly confident many of those factors would not have snowballed towards my resignation had Ms. Force been our CTE Director. 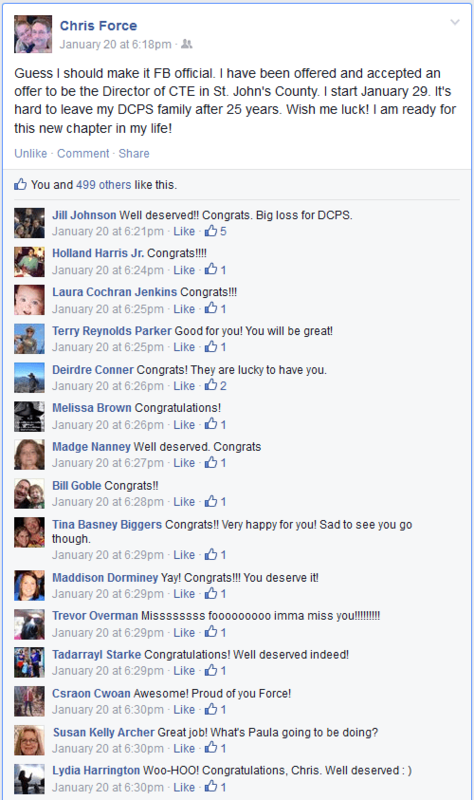 My loss may not be that great to DCPS, but Ms. Force’s loss is. I ask the School Board to perform their responsibility to oversee the Superintendent, determine whether there is substance behind the thoughts expressed here, and if further action is necessary to stop the bleeding.